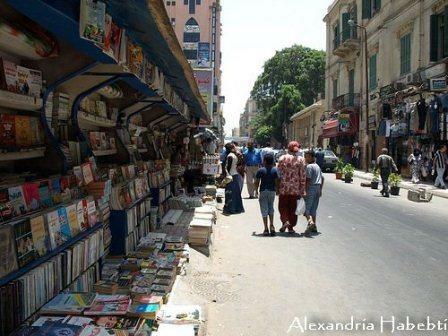 Photo from @salmasaid depicting Friday morning damage in Alexandria’s book market. 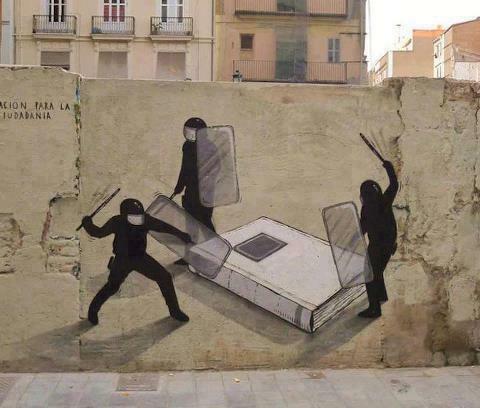 Street art from Valencia, Spain. 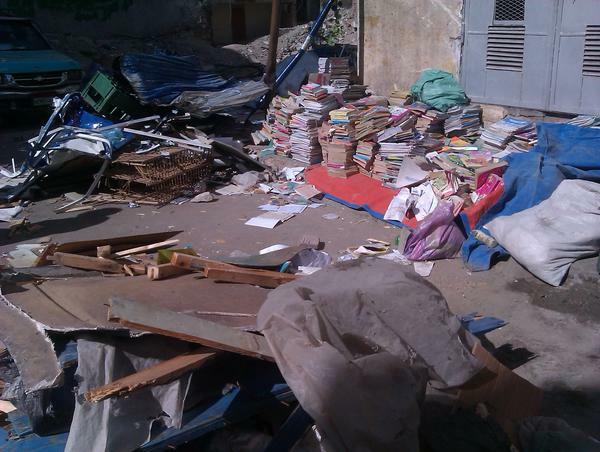 And so we can imagine that something similar happened on Al-Nabi Daniel Street in the early hours on Friday morning, when Alexandria’s security forces came and apparently smashed stalls at the historic book market, Alexandria’s equivalent of Azbekeyya. Orders for removal came from the city’s newly appointed governor, Mohamed Atta Abbas, according to Al Masry Al Youm. It was not immediately clear whether the book vendors were licensed or unlicensed: In any case, photographs show absurd and unnecessary destruction. Do books need to be licensed to be treated with respect? Do human beings? Al Masry Al Youm quoted a number of Cairo officials who promised an investigation. Alexandria-based activists also organized a demonstration Friday to protest the market’s destruction. They also told reporters that the kiosks had been properly licensed. Al-Nabi Danial St. “before,” via the group Alexandria Habibti. @SandySabbagh And I seriously wanted to go book shopping at ‫#النبي_دانيال‬ !! I PERSONALLY OBJECT TO THIS DECISION.